A few weeks ago Xyron held a Design Team Call. I am lucky enough to have been their DT coordinator for almost 10 years and during/after the call we got a lot of requests for feedback so I decided…why not do a Facebook Live and see if I can answer some of their questions? So I did – and the response was amazing. Everyone who participated was so much fun and I got some great questions – so for those of you who missed it (or folks who wanted written notes) I’ve included the entire FB Live here. I have NO idea how the audio and video got so out of sync – so just avert your eyes if it makes you nutty. 🙂 I’ve also written some quick bullet points below (the video is almost 40 minutes long) that cover the basics. 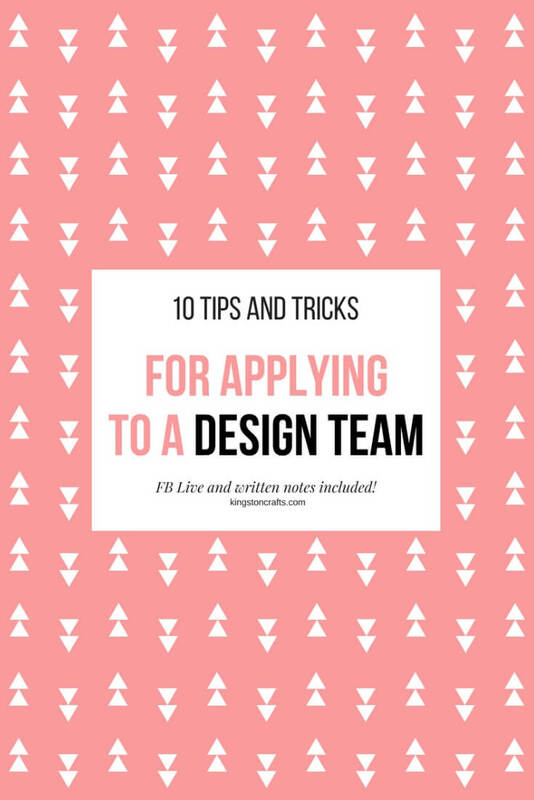 Please feel free to post if you’ve got any questions – I’m happy to help and hope this encourages you to try out for a design team or two! Focus on the photos. This would be in all caps with flashing lights if I knew how to do that. 😉 Take a look at photos of people who are selected for DTs and see how your photos compare in quality. Are they high resolution? Do they have good (natural) light? Do they have a clean or well styled background? Taking a class on “how to take better photos” was one of the best investments I made in my business. This is THE most important thing companies look for when selecting designers to work with. Photos, photos, photos, photos, photos! 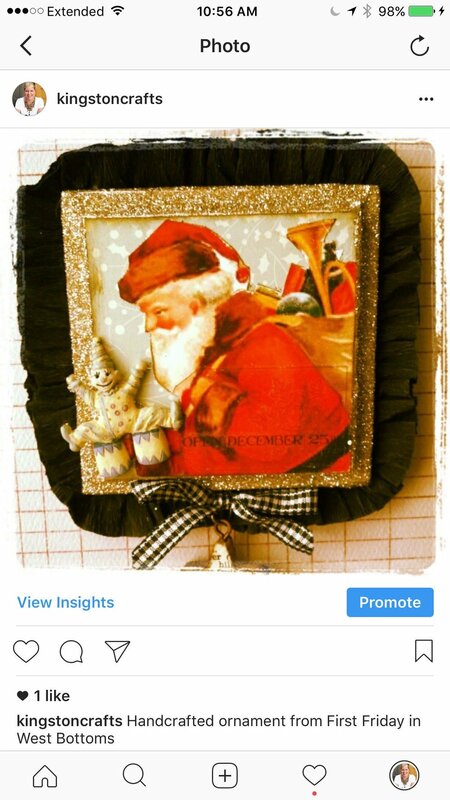 I shared these on the FB Live – but here is a quick comparison to the photos I was posting on IG two years ago (santa ornament) and the kinds of photos I am posting now (deer head). See the difference in clarity and quality and light and background? Be active on your own social media and online. Post frequently on your blog and other social media channels (we check). Know your limits/strengths and focus on the social media platforms you know you can do well (for example – I don’t do Twitter. I don’t “get it” and know I won’t enjoy it, so I just don’t do it and have to be ok with knowing I won’t be selected by companies that require it). If doing videos is something you feel comfortable with that gives you a leg up because many people don’t do them yet. Instagram and Facebook are currently the two most important social media platforms for most companies. Think of your blog/social media like a portfolio. 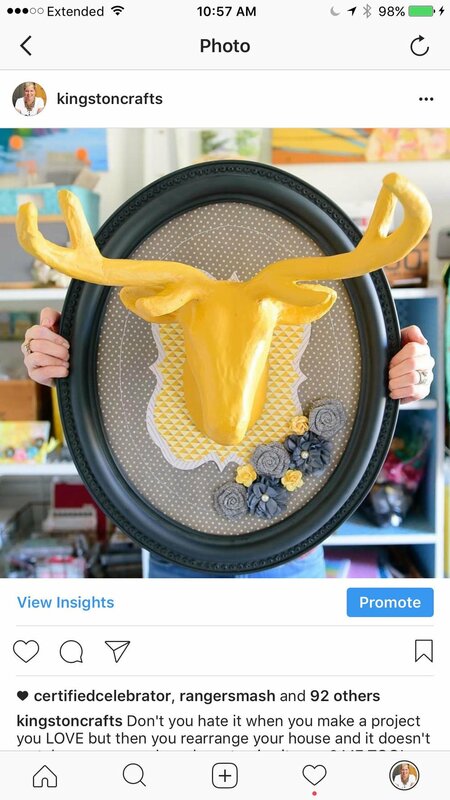 Think about creating a separate FB page/IG feed for your craft work. Don’t just post stuff to create content – quality is more important than quantity. Make sure all links are working on your blog and that all your information is updated. Make your blog work for you. Name and link to products you are already using (“Xyron Sticker Maker” instead of “adhesive”). Look in to affiliate links (amazon.com and scrapbook.com are both relatively easy to apply to). Go to Alexa.com (click on features/competitive intelligence/tools/website traffic statistics) to see where your blog stands in comparison to other blogs. Lots of pop up ads turns off companies – too hard to get to projects. Look for ways to share your projects. Contests, challenge blogs, guest blogger opportunities are all a chance to work with a company without long term commitment and vice versa. Participate in crafting community groups online and share your work. Apply to teams you use/love the product. Companies want people passionate about their product. Don’t just apply for everything out there. Follow companies you love on social media – many don’t advertise DT calls outside of their brand. Research them online. Do they have community boards? Challenges? Affiliates? Can you review products on their website? Look for any opportunity to get on their radar. Be nice/positive/do not get discouraged. Be kind and helpful EVERYWHERE — in forums, on Facebook, etc. Companies are not interested in working with drama queens. This is a very small world and everyone knows everyone – so word gets around. Gracefully accept critiques and be ok with no – use it as a learning experience. Share projects you love from companies/other designers on your own social media. We’re all in this together! Follow the directions/know what you are agreeing to. When it is time to apply, send a complete application, spell the company name correctly, don’t just copy and paste – let the company know how much you love them/why you love their products. Answer all the questions. Don’t ask for special treatment. Know what they want – cards, mixed media, home decor? Do they pay in product or cash? What is the time requirement? Make sure you know what you are getting in to. Know why you’re doing it. You are not going to get rich being on a DT, but it can open lots of doors. You have to be in it because you love it and the rest will come from that. Be you. Don’t try to be somebody else or change your style just to get on a design team – it will be too hard to maintain if you are chosen. Once you make a Design Team (hooray!) here are some tips for keeping your gig! Keep your commitments. Turn assignments in on time. If there were specifications for projects (make a card, make a spring themed project) make sure you follow them. Don’t make the coordinator track you down to get photos, links, etc. Be passionate. Be the company’s biggest cheerleader. Let your love for the product show in your projects and social media posts. If you’re just in it for the product/money, it’ll show, and you won’t be invited back. I hope that’s been helpful! Look forward to seeing your work on a design team in the future!